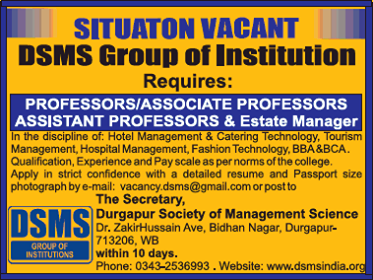 DSMS Group of Institution, Durgapur has advertised in THE TIMES OF INDIA newspaper for the recruitment of Professor/Associate Professor/Assistant Professor jobs vacancies. Interested and eligible job aspirants are requested to apply with in 10 days. Check out further more details below. About College: At DSMS – Management college in Durgapur learning is fun and interactive. Students stay motivated in an eco- friendly and refreshing ambiance backed up by the Art of living Yoga sessions, and fun-filled Zumba dance classes. Students are also encouraged to participate in University level sports competition and Cultural fests. All the courses are backed up by Industrial training & Internship programs where the students experience a first-hand training in real corporate firms that gives them an edge over others. These programs groomed the students to cope up with the ever-changing and challenging scenario for the industry.